Starbucks is known the world over for the continuity of its customer experience. Whether in Athens or Atlanta, customers can expect the same high-quality coffee drinks, made by friendly baristas who act as ambassadors for the world’s most iconic coffee brand. BrightSign integrator, OSM Solutions, has further personalized that experience with a new digital signage technology that gives drive-through customers a live look at the barista as their drinks are prepared. 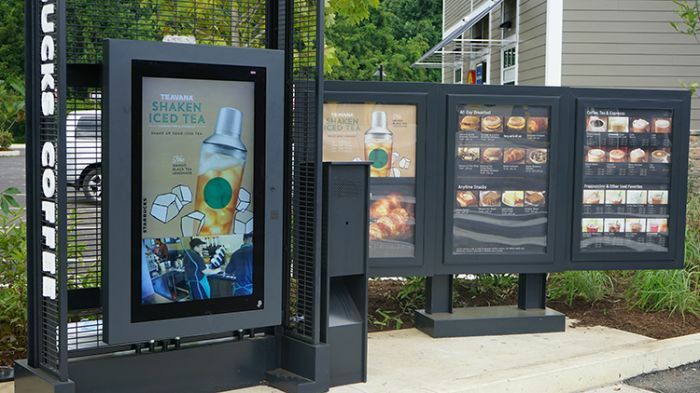 Six franchised Starbucks locations (and counting) with drive-through facilities now feature an outdoor digital menu board that packs a great deal of content onto a relatively compact screen. Menu content changes depending on the time of day, weaving in promotions and featuring seasonal items when appropriate. In addition to this dynamic menu content, customers are greeted with a live video feed of the barista’s station, where they can witness their drinks being prepared in real time. Drive-through facilities are often viewed as a convenience that sacrifices human interaction. This innovative use of digital signage is yet another example of how savvy business owners embrace technology to enrich customer interaction. Now weary drivers on the Pennsylvania Turnpike can pull off for a quick pick-me-up at this Starbucks and enjoy a personalized touch that raises the bar for drive-through dining experiences.